Q. What’s better than watching snowflakes fall? A. Eating them! Especially if they aren’t made from frozen water, but instead from gingery spicy cookie dough and sweet smooth icing. Yum! I absolutely love anything with ginger in it and ginger and molasses are an amazing combination! What’s even better is that these cookies are so easy to make and so fun to decorate. 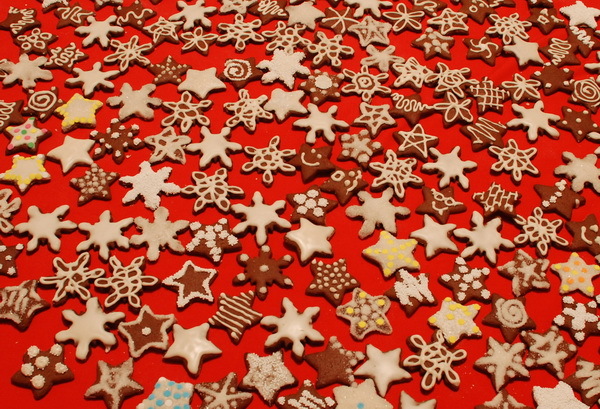 I made tiny stars and snowflakes (about 2 inches) so my recipe yielded almost 250 cookies… yikes! Although this is good if you plan to give them as gifts for the holidays (as I plan to). If you like your cookies soft, you should roll them thicker and bake them for less time. And if you like your cookies crispy, do just the opposite. I also decorated mine with sugar crystals and round white sprinkles, but the sky is really the limit for decorating, so be creative! I found the cookie recipe in Gourmet Magazine and the icing recipe on the Food Network’s website. Whisk together the flour, ginger, baking soda, cinnamon, cloves, pepper, and salt in a medium bowl, set aside. Cream the butter and sugar in an electric mixer with the paddle attachment until fluffy. Beat in the molasses, egg, and vinegar and mix until combined. Gradually add the flour, mixing on low speed until well incorporated. Separate the dough into four pieces, wrap in plastic, and refrigerate for at least 3 hours. Roll the dough out to 1/4 inch thickness onto a floured work surface. Use cookie cutters to cut stars and snowflakes, or whatever shapes your heart desires. Bake on greased cookie sheets for 6-8 minutes. Beat the egg whites and vanilla in a stand mixer with whisk attachment until frothy. 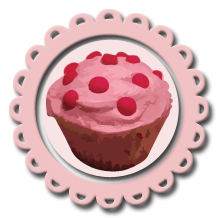 Add confectioner’s sugar gradually until sugar is incorporated and shiny. Turn speed up to high and beat until mixture forms stiff peaks, about 5-7 mintues. Transfer icing to a pastry bag. Decorate cookies with icing and sugar, if desired. Decorate with sugar or sprinkles. This entry was posted on Sunday, December 21st, 2008 at 12:29 am	and is filed under Cookies. You can follow any responses to this entry through the RSS 2.0 feed. You can leave a response, or trackback from your own site. Holy Moly! You’ve been busy. Wish I’d been there to help with the cookie decoration! they must taste even better than they look; and that, my dear, is nothing short of awesome!!!! Oh Kricket! those stars are amazing! I wish I had made them for all my friends and family. They are definitely next years Xmas gift. Perhaps with a tin of black tea??? Yummy.